Two goals in the third period from Wayne Gretzky, which completed his hat trick, led the 8th-seeded ’88-’89 Kings to a 5-2 win in Game 1. Goaltender Kelly Hrudey stopped 56 of 58 shots against in the win and he would continue to be very busy all series long. The ’88-’89 Kings took a 2-0 series lead after a 6-3 win in Game 2 after scoring four times in the first period. Gretzky scored one and added three assists for a four-point night to lead the offense while Hrudey made 41 saves. Gretzky then registered his second hat trick of the series in Game 3 as the ’88-’89 Kings won 5-2. Hrudey posted 50 saves while Luc Robitaille and Bernie Nicholls both posted multi-point games. The top-seeded ’13-’14 Kings and the reigning representatives avoided the sweep with a 4-2 win in Game 4. The game was tied 2-2 after two periods, but Marian Gaborik made it 3-2 late in the third before the top seed added an empty-netter. In the loss, Hrudey still made 55 saves. Remarkable. Then, in Game 5, John Tonelli began the scoring just over a minute into the game for the ’88-’89 Kings and then finished it with a goal in the middle of the third to seal a 4-2 win. With that, there will be a new representative for the Los Angeles Kings in the 2015 Ultimate NHL Playoff. Up next in the 4-5 matchup between the ’12-’13 Kings and the ’00-’01 Kings! 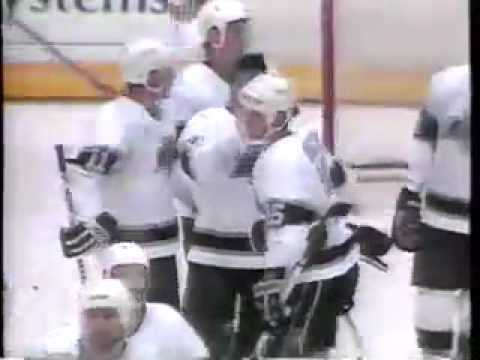 This entry was posted in Qualifying Tournament, Ultimate NHL Playoff and tagged Bernie Nicholls, Dale DeGray, Dave Taylor, Drew Doughty, John Tonelli, Kelly Hrudey, Los Angeles Kings, Luc Robitaille, Marian Gaborik, Mike Richards, Qualifying Tournament, Ultimate NHL Playoff, Wayne Gretzky. Bookmark the permalink.